Product #46074 | SKU EFS35M | 0.0 (no ratings yet) Thanks for your rating! 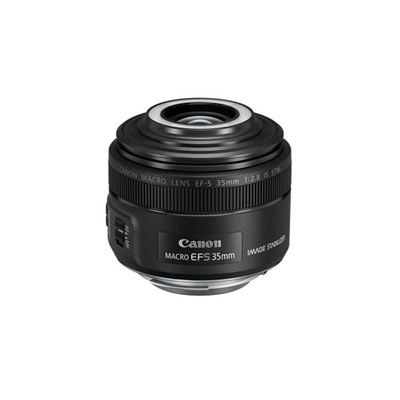 Characterised by its unique design and close-up capabilities, the EF-S 35mm f/2.8 Macro IS STM from Canon is a 56 mm-equivalent prime lens designed for APS-C-format DSLRs. Offering a life-size 1:1 maximum magnification and a 13 cm minimum focusing distance, this lens further distinguishes itself with an integrated Macro Lite LED on the front of the lens to provide additional illumination to close-up subjects. Aiding its ability to reproduce small subjects at life size, the optical design incorporates one aspherical element to reduce spherical aberrations in order to provide a high degree of sharpness and clarity. Benefitting the optical attributes is a Hybrid IS image stabilisation system that serves to minimise the appearance of camera shake for sharper results when working handheld and in difficult lighting conditions. A lead screw-type STM stepping motor also benefits handling by producing fast, smooth, and quiet autofocus performance to suit both stills and video applications. This AF motor can be manually overridden at any time by turning the dedicated focusing ring for making fine-tuned adjustments. Standard macro prime designed for APS-C-format Canon DSLRs, this lens offers a 56mm equivalent focal length. One glass-moulded aspherical element is featured in the optical design to control spherical aberrations and deliver a high degree of sharpness and clarity. Maximum 1:1 magnification and a minimum focusing distance of 13 cm permits making life-size imagery of close-up subjects. Hybrid IS image stabilisation minimises the appearance of camera shake for sharper imagery when shooting handheld.